The member States of the European Union have unanimously aligned themselves with the military strategy of their American big brother. They have accepted that their own territory may transform itself into a nuclear battleground in the case of conflict between the United States and Russia. Near the United Nations Glass Palace in New York, there is a metallic sculpture entitled “Evil Defeated by Good”, representing Saint George transfixing a dragon with his lance. It was donated by the USSR in 1990 to celebrate the INF Treaty concluded with the USA in 1987, which banned land-based short- and mid-range nuclear missiles (a reach of between 500 and 5,000 km). 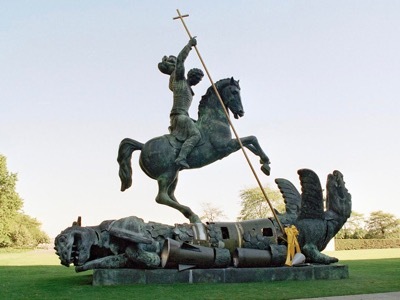 Symbolically,the body of the dragon is in fact made with pieces of US Pershing-2 ballistic missiles (originally based in West Germany) and Soviet SS-20 missiles (originally based in the USSR). Ignoring all that, the EU representative at the UNO accused Russia of sabotaging the INF Treaty, and announced the opposition vote by all the countries of the Union because “the resolution presented by Russia avoids the question under discussion”. Essentially, therefore, the European Union has given the green light to the possible installation of new US missiles in Europe, including Italy.